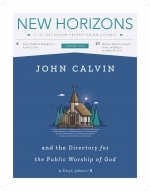 It can be argued that John Calvin is among the most important liturgists in the history of the Christian church. Indeed, I have attempted to make the case that his Genevan Psalter of 1542 and its Form of Church Prayers established a norm for worship. It doesn’t take much time reading the Old and New Testaments to notice some significant differences between them when it comes to corporate worship. The differences are clearly seen when considering the three primary elements of Old Testament worship: the place, the priest, and the sacrifice.